Abstract. Recent registry studies comparing mortality between peritoneal dialysis (PD) and hemodialysis (HD) patients show conflicting results. The purpose of this study is to determine whether previously published results showing higher mortality for patients treated with PD versus HD in the United States continue to hold true over the period 1987-1993. National mortality rates for PD and HD were extracted from the U.S. Renal Data System (USRDS) annual reports for the cohort periods: 1987-1989, 1988-1990, 1989-1991, 1990-1992, and 1991-1993. Using Poisson regression, death rates per 100 patient years were compared between PD and HD for each cohort period controlling for age, gender, race, and cause of end-stage renal disease (diabetes versus nondiabetes). When incident patients and patients with a prior transplant were included in the analysis, starting with the 1989-1991 cohort, we found little or no difference in the relative risk (RR PD:HD) of death between PD and HD (1987-1989: RR = 1.17, P < 0.001; 1988-1990: RR = 1.12, P < 0.001; 1989-1991: RR = 1.06, P = NS; 1990-1992: RR = 1.06, P = NS; 1991-1993: RR = 1.08, P = 0.043). After a test for goodness-of-fit, separate analyses for diabetic patients and nondiabetic patients were done to examine unexplained variation in death rates. For nondiabetic patients, there was less than a 1% difference in the adjusted 1-yr survival between PD and HD from 1989-1993 (1989-1991: RR = 1.05, P = NS; 1990-1992: RR = 1.04, P = NS; 1991-1993: RR = 1.07, P < 0.01). Among diabetic patients, the PD:HD death rate ratio varied significantly according to gender and age. For the average male diabetic patient, there was little or no difference in risk between PD and HD from 1989-1993 (1989-1991: RR = 1.02, P = NS; 1990-1992: RR = 1.05, P = NS; 1991-1993: RR = 1.08, P < 0.01). For diabetic patients under the age of 50, those treated with PD had a significantly lower risk of death than those treated with HD (1989-1993: 0.84 ≤ RR ≤ 0.89, P < 0.005). Over the same period, female diabetic patients treated with PD had a higher risk, on average, than HD (1.18 ≤ RR ≤ 1.19, P < 0.001) as did diabetic patients over the age 50 (1.28 ≤ RR ≤ 1.30, P < 0.001). Unlike previously published results that were restricted to prevalent-only patients, this national study of both prevalent and incident patients found little or no difference in overall mortality between PD and HD. The recent trends in mortality likely reflect the inclusion of incident patients, but they may also reflect changes in case-mix differences and/or improved PD practice. Additional incident-based studies that allow for additional case-mix adjustments are needed to better compare outcomes between HD and PD. Kidney transplantation is generally accepted as the optimal form of renal replacement therapy in that it provides patients with end-stage renal disease (ESRD) the best prognosis for survival and quality of life (1, 2, 3, 4). However, given the rapid rise in the incidence of ESRD in the United States and other countries (5, 6, 7, 8), and the continued shortage of donor kidneys, most patients with ESRD will need some form of dialysis during their life. To date, no consensus has been reached regarding which form of dialysis, peritoneal dialysis (PD) or hemodialysis (HD), offers patients the best chance for survival. Results from single center and multicenter studies show conflicting results with respect to the survival benefits of one therapy over another (9, 10, 11, 12, 13, 14, 15, 16). It has been argued that many of these studies are too small to provide the kind of statistical power needed to detect clinically relevant differences in patient survival (17). However, recently published results from two large-scale national studies also show an apparent discrepancy with respect to differences in mortality between PD and HD (17,18). Bloembergen et al. (17) found that, on average, patients treated with PD had a 19% higher adjusted mortality rate than patients treated with HD (a relative risk [RR] of 1.19, P < 0.001). Their results were based on a prevalent cohort of U.S. patients covering a 3-yr period (1987-1989) and entailed 42,372 deaths and 170,700 patient years at risk. In contrast, Fenton et al. (18) demonstrated a 27% lower adjusted mortality rate among patients treated with PD versus HD (RR = 0.73; 95% confidence interval, 0.68 to 0.78). These results were from an incident cohort of 11,970 Canadian patients covering the calendar period 1990-1994. When Fenton et al. used the methodology of Bloembergen et al., they found no difference in mortality between PD and HD. In the present study, we use national death rates published in the USRDS annual reports (19, 20, 21, 22, 23) to analyze trends in mortality over a 7-yr period (1987-1993). Our goal is to determine whether the differences in mortality between PD and HD reported by Bloembergen et al. continue to hold true in subsequent cohort years. The inclusion of both prevalent and incident patients in later cohorts (1989-1993) allows a comparison of mortality that may help explain some of the apparent discrepancies between previous studies. Age, gender, race, and disease-specific mortality rates (all causes) and their associated standard errors were extracted from the USRDS annual reports covering the cohort periods: 1987-1989, 1988-1990, 1989-1991, 1990-1992, and 1991-1993 (19, 20, 21, 22, 23). The data for each cohort period summarize the annual mortality experience of dialysis-treated ESRD patients in the United States who qualify for Medicare and who survive for a minimum of 90 d on renal replacement therapy. Each of the five overlapping cohort periods covers 3 consecutive years, with data from each year corresponding to a national census of either prevalent-only patients (1987-1989, 1988-1990) or combined prevalent and incident patients (1989-1991, 1990-1992, 1991-1993). For the cohort periods 1987-1989 and 1988-1990, PD and HD mortality rates were calculated for each year based only on those patients alive on January 1 of that year and who had reached day 91 of ESRD. Patients were classified as receiving PD or HD provided they were on the therapy a minimum of 60 d (19,20). According to USRDS methodology, incident (new) patients who entered ESRD therapy during a given year were excluded from the analysis for that year but were included for analysis the following year provided they survived to January 1. In addition, for the 1988-1990 cohort period, any patient classified as lost to follow-up at the beginning of a year was excluded from the analysis for that year (20). Beginning with the 1989-1991 cohort period and continuing through 1991-1993, the USRDS methodology for calculating death rates changed by allowing all new incident patients to be included in the calculation (21, 22, 23). Reasons for this change are discussed in Chapter XV of the 1994 USRDS Report (21). As with prevalent patients, only those incident patients who survive the first 90 d of ESRD are included. Also, unlike the previous cohort periods, patients who were previously transplanted were included in the calculation of annual death rates (21, 22, 23). Thus, the mortality rates published by the USRDS for the 1987-1989 and 1988-1990 cohorts reflect prevalent-only patients, whereas the death rates for the 1989-1991, 1990-1992, and 1991-1993 cohorts reflect both prevalent and incident patients. In any given year, the USRDS calculates PD and HD death rates by simply summing up the number of deaths that occurred during the year and dividing by the total number of patient years at risk. Patient age (5-yr age increments starting with 20 to 24 and ending with 85+), gender, race (black or white), cause of ESRD (diabetes versus all other causes), and treatment modality (PD or HD) are all classified at the beginning of follow-up of each year (19, 20, 21, 22, 23). Deaths among patients switching therapy during a given year are attributed to the initial therapy for that year. This corresponds to an “Intent-To-Treat” (ITT) analysis for a specific year. However, patients who switch therapy during a given year and survive the full year are classified on the new therapy the following year (19, 20, 21, 22, 23). If the patient then dies that following year, the death would be attributed to the more current therapy. This corresponds more closely to a “Treatment History” or “As-Treated” analysis whereby treatment modality represents a time-dependent covariate. Thus, the present study, like Bloembergen et al. (17), combines the “Intent-To-Treat” and “As-Treated” approaches to analysis. The observed death rate for a group of patients is defined as the total number of deaths divided by the total number of patient years at risk for that group. The corresponding standard error of the death rate is calculated as the square root of the death rate divided by the square root of the number of patient years at risk. Using this relation, we converted the published age, gender, race, and disease-specific death rates (DR) and standard errors into total number of deaths and patient years at risk. For each cohort period, Poisson regression using the GENMOD procedure of SAS version 6.12 (Cary, NC) was done to compare DR between PD and HD controlling for differences in age, gender, race, and cause of ESRD (24, 25, 26, 27). To compare mortality trends across the different cohort periods, we computed average DR for various subgroups of patients using, as a reference population, those prevalent patients treated for ESRD on December 31, 1992 (22). Model goodness-of-fit was assessed based on the model deviance and degrees of freedom (df). The model deviance is a statistic that measures how close the predicted DR are to the observed DR. An analysis of deviance was used to test for goodness-of-fit, and the ratio deviance/df was used to measure possible model overdispersion and/or lack of fit (24). In the presence of significant overdispersion, we assessed model goodness-of-fit by an analysis of deviance in which we perform a χ2 test on the difference in deviance between the proposed model and the saturated model containing all possible interactions (24). All hypothesis testing was carried out with corrections for overdispersion when indicated (24, 25, 26, 27), and only P values <0.05 are reported as statistically significant. The demographics of the reference population used to calculate adjusted all-cause DR for select groups of patients are summarized in Table 1. Since the demographics of the ESRD population changes over time, use of a single reference population is necessary if we are to compare adjusted DR across different cohorts of patients. We elected to use those prevalent patients treated for ESRD on December 31, 1992, as they represent the midpoint of the last cohort period 1991-1993. Summarized in Table 2 are the total number of deaths and total patient years at risk for each cohort period, as well as those reported by Bloembergen et al. (17). The values for the 1987-1989 cohort differ only slightly from that reported by Bloembergen et al., and this may be due to a difference in availability of data at the time of analysis. The inclusion of incident patients, starting with the 1989-1991 cohort, results in a near doubling of the sample size from 1987-1989 to 1991-1993. This greatly affects the statistical power with which we can detect differences, even though those differences may be clinically irrelevant. Initially, we compared death rates between PD and HD using a Poisson regression model similar to that used by Bloembergen et al. (17). The model included terms for age, gender, race (black or white), cause of ESRD (diabetes or nondiabetes), and treatment modality (PD or HD). In addition, all two-way interactions with treatment modality were included in the model (i.e., age by modality, gender by modality, race by modality, and cause by modality). To check for consistency and reproducibility, we first applied this model to the 1987-1989 cohort and compared our results against those reported by Bloembergen et al. (17). As shown in Figure 1, we obtained very nearly the same adjusted relative risks of death (PD:HD). After this, we applied the model to all five cohort periods in an effort to determine whether the reported difference in DR between PD and HD continued to hold in later cohorts. Figure 2 compares the all-cause DR between PD and HD after adjustment for age, gender, race, and cause of ESRD. The DR are for patients with the average characteristics of the reference population. Included are the relative risks (RR) of death, which are computed as the DR for PD divided by the DR for HD, and the corresponding adjusted 1-yr survival estimates, which are computed as exp(-DR/100). Starting with the 1989-1991 cohort, there was little or no difference in overall mortality between PD and HD. Moreover, there was a general decrease in the adjusted all-cause DR over time for both PD and HD. The trend toward equivalence in mortality between PD and HD was seen to hold for males, females, whites, and nondiabetic patients, but a significantly higher risk of death was seen among diabetic patients and blacks on PD (Table 3). Unlike Bloembergen et al., we failed to detect any significant age by modality interaction with this model, although there were trends for higher mortality among older PD patients compared with older HD patients (data not shown). Relative risk (RR) of death (PD:HD) among select subgroups of patients comparing the results from the present study to that of Bloembergen et al. (17) for the 1987-1989 cohort of prevalent-only patients. RR values are adjusted for age, gender, race, and cause of end-stage renal disease (ESRD). Diabetic and nondiabetic patients are analyzed together in the same model. Trends in adjusted all-cause death rates (DR) for patients treated with hemodialysis (HD) and peritoneal dialysis (PD). These overall DR are for ESRD patients having the average characteristics of the reference population. RR and 1-yr survival estimates are adjusted for age, gender, race, and cause of ESRD. Diabetic and nondiabetic patients are analyzed together in the same model. A global goodness-of-fit test was performed to assess how well the model fit the data. The test showed that there was a significant lack of fit for each cohort (deviance/df > 3.4, P < 0.001). When the data were fit to a completely saturated model having all higher-order interactions, a global goodness-of-fit test indicated that significant overdispersion was present for each cohort. When we corrected for this overdispersion via an analysis of deviance, we found the proposed model still showed a significant lack of fit for each cohort (χ2 > 883.3, df < 188, P < 0.001). This indicates the possibility that important interactions between age, gender, race, cause of disease, and modality are being ignored. Because there were strong two-way interactions between cause of ESRD and treatment modality across each cohort, we performed a second analysis whereby observed death rates were modeled separately for diabetic patients and nondiabetic patients. In each case, we used a Poisson regression model that included the effects of age, gender, race, treatment modality, and all two-way interactions with treatment modality. The model also included a race by age interaction term, which we, like others (15,28), found to be significant. By doing separate analyses for diabetic patients and nondiabetic patients, we effectively accounted for two- and three-way interactions, which the original integrated model did not. We found that among diabetic patients, the new model provided a good fit to the data for the 1987-1989, 1988-1990, 1989-1991, and 1990-1992 cohorts (deviance/df < 1.23, P = NS), and a marginal lack of fit for the 1991-1993 cohort (deviance/df = 1.70, P < 0.001). For nondiabetic patients, there was significant overdispersion that could not be explained even on the basis of a completely saturated model. After accounting for this overdispersion via an analysis of deviance, the new model was found to provide a good fit to the observed death rates among nondiabetic patients for the 1987-1989 and 1988-1990 cohorts (χ2 < 79.43, df = 66, P = NS) and a marginal lack of fit for the later cohorts (104.03 < χ2 < 133.80, df = 66, P < 0.01). To correct for possible lack of fit among nondiabetic patients, the standard errors used in hypothesis testing were all adjusted for overdispersion (29,30). Among prevalent-only nondiabetic patients (1987-1989, 1988-1990), those treated with PD had a significantly higher mortality rate, on average, than those treated with HD (1.17 ≤ RR ≤ 1.11, P < 0.01) (Figure 3). The absolute difference in mortality was 2.6 deaths per 100 patient years (or a 2% difference in 1-yr survival) in 1987-1989 and 1.7 deaths per 100 patient years (or a 1% difference in survival) in 1988-1990. Among incident and prevalent nondiabetic patients (1989-1993), there were little or no differences in the adjusted all-cause DR between PD and HD, the maximum difference being 1 death per 100 patient years (or 0.8% difference in 1-yr survival) (Figure 3). 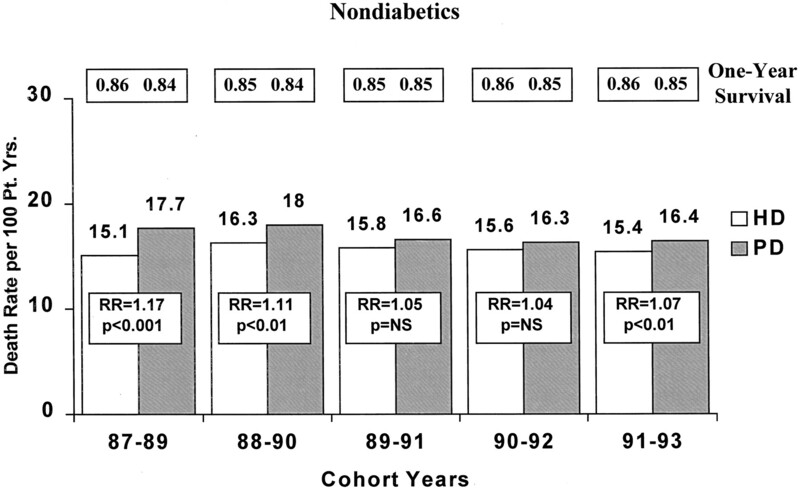 Moreover, except for the 1991-1993 cohort of black nondiabetic patients (PD: DR = 17.2, 84% 1-yr survival; HD: DR = 14.5, 87% 1-yr survival; RR = 1.19, P < 0.001), there were no statistically significant differences (interactions) in adjusted DR among nondiabetic PD and HD patients across age, gender, or race from 1989-1993. Trends in adjusted all-cause DR for nondiabetic patients treated with HD and PD. DR are for patients with the average characteristics of the reference population. RR and 1-yr survival estimates are adjusted for age, gender, race, and cause of ESRD, but with nondiabetic patients analyzed separately from diabetic patients. On average, DR among diabetic patients treated with PD were significantly higher than those treated with HD (RR ≥ 1.10, P < 0.001) (Figure 4). However, these results must be interpreted with care given that there were statistically significant gender by modality and age by modality interactions present in the model. When these interactions were accounted for, the higher risk of death associated with diabetic patients on PD was found to be concentrated among females (RR ≥ 1.18, P < 0.001) (Figure 5) and patients over the age of 50 (RR ≥ 1.28, P < 0.001) (Figure 6). The absolute difference in mortality among incident and prevalent female diabetic patients was between 4.6 and 5.1 deaths per 100 patient years (corresponding to a 3 to 4% difference in 1-yr survival), whereas among incident and prevalent diabetic patients over the age of 50, the PD DR exceeded the HD DR by 9.3 to 10.0 deaths per 100 patient years (corresponding to a 6 to 7% difference in 1-yr survival). On average, there were no statistically significant differences in the PD and HD DR among male diabetic patients from 1989-1992 (RR ≤ 1.05, P = NS) and only marginal differences in 1988-1990 (RR = 1.08, P = 0.045) and 1991-1993 (RR = 1.08, P < 0.01) (Figure 7). Among incident and prevalent male diabetic patients, the absolute difference in mortality ranged from 0.7 to 2.1 deaths per 100 patient years, which translates into a 1% difference in 1-yr survival (Figure 7). Among diabetic patients under the age of 50, patients treated with PD had a significantly lower risk of death than those treated with HD (1989-1993: RR ≤ 0.89, P < 0.005) (Figure 8). Specifically, those incident and prevalent diabetic patients under the age of 50 who were treated with PD had between 2.1 and 3.4 fewer deaths per 100 patient years than those treated with HD, and this corresponds to a 2 to 3% difference in 1-yr survival (Figure 8). There were no significant effects of race on the relative risk of death between PD and HD diabetic patients for any of the five cohorts (P > 0.1375). Trends in adjusted all-cause DR for diabetic patients treated with HD and PD. DR are for patients with the average characteristics of the reference population. 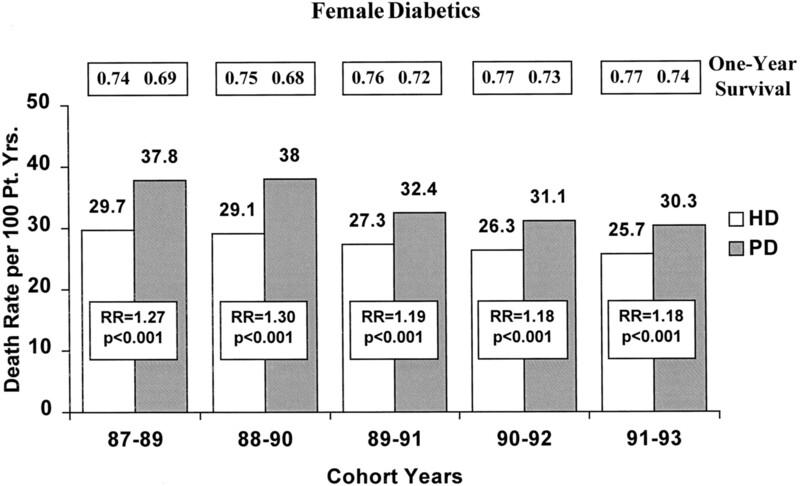 RR and 1-yr survival estimates are adjusted for age, gender, race, and cause of ESRD, but with diabetic patients analyzed separately from nondiabetic patients. Trends in adjusted all-cause DR for female diabetic patients treated with HD and PD. DR are for patients with the average characteristics of the reference population. RR and 1-yr survival estimates are adjusted for age, gender, race, and cause of ESRD, but with diabetic patients analyzed separately from nondiabetic patients. 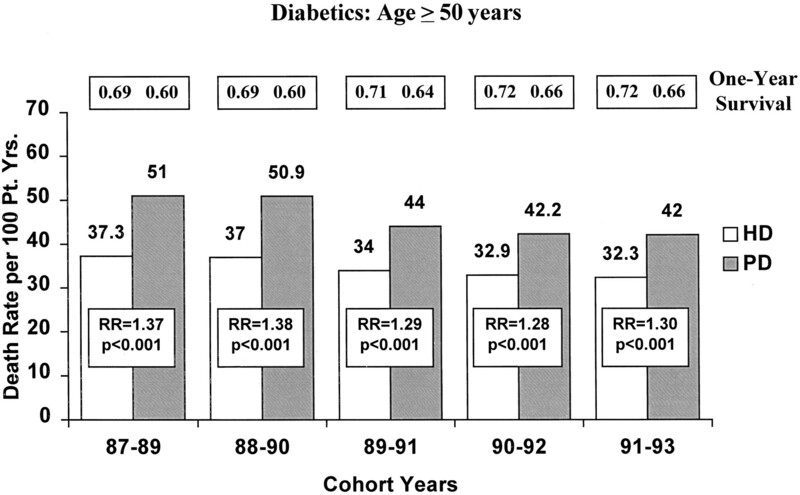 Trends in adjusted all-cause DR for older (age ≥50) diabetic patients treated with HD and PD. DR are for patients with the average characteristics of the reference population. RR and 1-yr survival estimates are adjusted for age, gender, race, and cause of ESRD, but with diabetic patients analyzed separately from nondiabetic patients. Trends in adjusted all-cause DR for male diabetic patients treated with HD and PD. DR are for patients with the average characteristics of the reference population. RR and 1-yr survival estimates are adjusted for age, gender, race, and cause of ESRD, but with diabetic patients analyzed separately from nondiabetic patients. Trends in adjusted all-cause DR for younger (age <50) diabetic patients treated with HD and PD. DR are for patients with the average characteristics of the reference population. RR and 1-yr survival estimates are adjusted for age, gender, race, and cause of ESRD, but with diabetic patients analyzed separately from nondiabetic patients. Using a Poisson regression model similar to that used by Bloembergen et al. (17), the present study found little or no significant difference in overall mortality between PD and HD when both incident and prevalent patients are included in the analysis. To improve the overall model goodness-of-fit, separate analyses were done for diabetic patients and nondiabetic patients. We found that among incident and prevalent nondiabetic patients, there was less than a 1% absolute difference in the average adjusted 1-yr survival between PD and HD. Among diabetic patients, our study found that patients treated with PD had a significantly higher risk of death, on average, than those treated with HD. However, this risk was concentrated among females and patients over the age of 50. For the average male, this risk was generally small and insignificant, while for diabetic patients under 50, the risk was significantly lower for patients treated with PD versus HD. The results from this study both agree and disagree with other registry-based studies comparing mortality between PD and HD (15,17, 18). As reported previously by Bloembergen et al. (17), we found that for the prevalent-only patient cohort of 1987-1989, the adjusted risk of death was higher among patients treated with PD compared with HD both overall and across gender, race, and cause of ESRD. Indeed, when we compared PD and HD mortality using a model comparable to theirs, we obtained similar estimates of RR (Figure 1). What small differences there are may be attributed to the following methodologic differences. First, unlike Bloembergen et al., we did not have available information that would allow us to adjust for prior time on ESRD therapy (< 1 yr versus > 1 yr). Second, we modeled age as a categorical variable using the 5-yr age increments reported in the USRDS annual reports. Bloembergen et al. modeled age as a continuous covariate assuming a log linear relation with DR. The approach we took is slightly more general in that it allows the log death rate to vary with age in a possibly nonlinear manner. Third, we used a different reference population in calculating average adjusted DR. Despite these differences in methodology, the results we obtained for the 1987-1989 cohort closely agree with the results published by Bloembergen et al. (17). However, when we applied the same model to subsequent cohorts, and also when we performed separate analyses for diabetic patients and nondiabetic patients, we found a different set of results, most of which agree with other registry-based studies (14,15,18). For the 1988-1990 cohort of prevalent-only patients, we found a reduction in RR between PD and HD both overall (Figure 2) and across gender, race, and cause of ESRD (Table 3). Although still statistically significant for females, blacks, whites, and diabetic patients, the average PD:HD risk ratio was no longer statistically significant for males and nondiabetic patients, a result that differs from the 1987-1989 cohort. Because the only methodologic difference between the two cohorts is the exclusion, in 1988-1990, of patients classified as lost to follow-up (20), these findings indicate that the 1987-1989 cohort results are not, in general, representative of later cohorts even when restricted to prevalent-only patients. This is a somewhat surprising result given the considerable overlap in data between the two cohorts. When incident (new) patients and patients with a prior transplant were included in the analysis, starting with the 1989-1991 cohort, we found little or no difference in overall mortality between PD and HD. Because we used the same model and methods for all five cohorts, much of the discrepancy across cohorts may be attributable to the inclusion of incident patients. By excluding incident patients, the 1987-1989 and 1988-1990 cohorts ignore those deaths and times at risk within a calendar year that are attributable to new patients starting dialysis that year. If the PD and HD mortality rates are not proportional to one another during the first year or so of dialysis, then such informative censoring can bias the results in favor of one modality over the other. Evidence for nonproportional DR over time can be found in the study by Fenton et al. (18), in which the PD:HD death rate ratio varies with time (their Figures 2 and 3 ()). 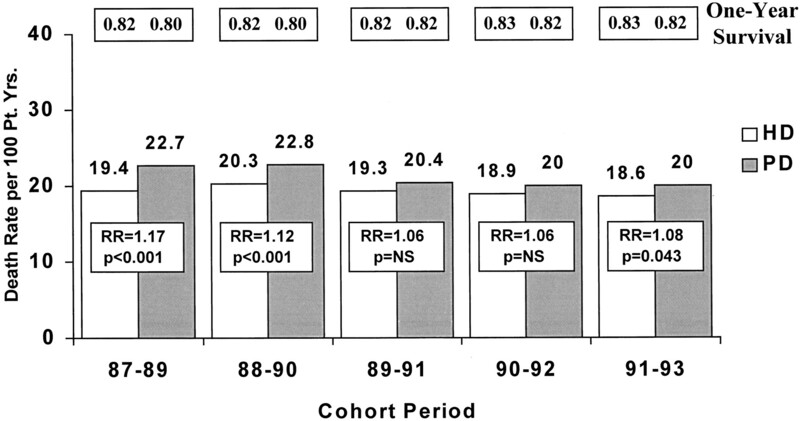 If similar time-dependent trends in RR occur in the United States, then the results for the 1987-1989 and 1988-1990 cohorts may be biased in favor of HD. Indeed, indirect evidence of this is provided by Bloembergen et al., who showed the RR of death (PD:HD) is lower among prevalent patients who have been on dialysis <1 yr compared to those who have been on dialysis >1 yr (17). Despite this attempt at correcting for time on dialysis, their results may still be influenced by the exclusion of patients who die during the calendar year they started dialysis. By including both incident and prevalent patients, the 1989-1991, 1990-1992, and 1991-1993 cohorts provide for a better overall comparison of patient mortality between PD and HD. When we compared PD and HD diabetic patients and non-diabetic patients together in the same model and then separately, we obtained somewhat different results. When analyzed separately, we found that the PD:HD RR was generally higher in nondiabetic patients (Figure 3) and lower in diabetic patients (Figure 4) than when we analyzed them together in the same model (Table 3). Given the discrepancy between results and judging from the improved fit to the data, the results obtained from separate analyses for diabetic patients and nondiabetic patients should be used when evaluating the differences in mortality between PD and HD. We included the results obtained when diabetic patients and nondiabetic patients are analyzed together in one model so as to compare them directly against the results of Bloembergen et al. (17). In addition to providing a better fit to the data, analyzing diabetic patients and nondiabetic patients separately allowed us to do further subgroup comparisons, which we could not do with the initial model. We found that among both incident and prevalent nondiabetic patients (1989-1993), there were little or no significant differences in mortality between PD and HD both overall and across age, gender, and race (the one exception being the 1991-1993 cohort of black nondiabetic patients). These results are more consistent with findings from the Michigan Kidney Registry (14,31). There, Nelson et al. (14,31) found that among 7741 incident patients living in Michigan from 1980-1989, there were no significant differences in the age, gender, and race adjusted risk of death between continuous ambulatory peritoneal dialysis (CAPD) and HD nondiabetic patients. Our results also agree with the case-mix adjusted study of Held et al. (15). They found that among a U.S. sample of 2411 nondiabetic patients incident between 1986-1987, there were no significant differences in risk between CAPD and HD (RR = 0.84, P = NS), or between continuous cycling peritoneal dialysis and HD (RR = 0.95, P = NS). Likewise, Fenton et al. (18), using an “Intent-to-Treat” analysis and a 90-d exclusion rule similar to Held et al., found no significant difference in risk between PD and HD among 7926 incident-based nondiabetic patients (age <65: RR = 0.92, P = NS; age ≥65: RR = 0.95, P = NS). However, when the authors did an “As-Treated” analysis, they found that nondiabetic patients treated with PD had a significantly lower risk of death (age <65: RR = 0.54, P < 0.05; age ≥65: RR = 0.76, P < 0.05) (18). Among incident and prevalent diabetic patients, we found that patients treated with PD had, on average, a significantly higher risk of death than those treated with HD. However, this risk was concentrated among females and patients over the age of 50, and was small and insignificant among males. For diabetic patients under the age of 50, the risk was significantly lower for PD. These results are likewise similar to other registry-based findings (14,15,18,31). Specifically, our results closely agree with the Michigan Kidney Registry, where Nelson et al. (14) found that among 4288 incident diabetic patients ages 20 to 59, the risk of death was significantly lower among those treated with PD (0.40 < RR < 0.70, P < 0.05 for patients under 52 yr of age). For diabetic patients 60 yr and older, they found a 19% higher risk of death among patients treated with CAPD compared with HD (P = 0.08) (31). Held et al. (15) found no significant difference in adjusted risk between PD and HD for younger diabetic patients (age <50: RR = 1.11, P = 0.68), but the risk was significantly higher for older diabetic patients on PD (age ≥50: RR = 1.34, P = 0.02). The discrepancy in results between Nelson et al. (14) and Held et al. (15) for younger diabetic patients might be explained on the basis of comorbidity. Specifically, there is evidence that younger diabetic patients treated with PD have a lower level of comorbidity than those treated with HD (32). This may account for why both our study and Nelson's study, neither of which adjust for comorbidity, show significantly lower mortality among younger diabetic patients on PD versus HD, compared with Held's study, which, after adjustment for comorbid events, shows no significant difference in mortality. Further evidence in support of our present findings is provided by the Canadian Organ Replacement Register. There, Fenton et al. (18) found no significant difference in risk between PD and HD among 2707 incident diabetic patients using an “Intent-to-Treat” analysis (age <65: RR = 0.92, P = NS; age ≥65: RR = 1.10, P = NS). When they compared PD and HD using an “As-Treated” analysis, Fenton et al. found a significantly lower risk of death associated with PD in both young and old diabetic patients (age <65: RR = 0.73, P < 0.05; age ≥65: RR = 0.88, P < 0.05). This result did not appreciably change even after excluding deaths that occurred during the first 90 d of treatment (18). The U.S. and Canadian results, although fairly concordant for younger diabetic patients, are at odds for older diabetic patients. Even after adjustment for differences in comorbidity, older diabetic patients in Canada were shown to have comparable or better survival on PD relative to HD (18), whereas older diabetic patients in the United States were seen to have worse survival on PD (15). Given that 27% of patients are initially selected to receive PD in Canada (18) compared with only 15% in the United States (5), the greater degree of experience with PD in Canada may offer one source of explanation. There is also recent evidence that PD patients in Canada may be more compliant with their prescriptions than their counterparts in the United States (33). Further research in this area is needed. Perhaps the most distinguishing feature that separates the present study from previous registry-based studies is that this study represents a blend of both incident and prevalent patients. When restricted to prevalent-only patients (1987-1989, 1988-1990), the results from this study closely agree with Bloembergen et al. (17). However, when based on both incident and prevalent patients (1989-1991, 1990-1992, 1991-1993), the results more closely agree with other large-scale registry studies, both in the United States (14,15,31) and in Canada (18). This is especially true when separate analyses are done for diabetic patients and nondiabetic patients. Although the impact of including incident patients on the RR of death between PD and HD is fairly evident, we must also consider what impact differential improvements in the two therapies may have had on changes in the PD:HD RR over time. For example, improvements in PD connectology and better patient compliance may have contributed, in part, to the improvement in the PD:HD RR. Also, for the more recent cohorts, there may have been changes in patient case-mix differences between PD and HD that might partially account for changes in the PD:HD RR. For instance, Held et al. (34) recently reported that among 1996 incident patients, those starting PD have lower levels of comorbidity than those starting HD. However, it is somewhat doubtful that this more recent trend would account for the differences in RR observed between the 1987-1989, 1988-1990, and 1989-1991 cohorts, given the fact that there is an overlap in years for these cohorts and the fact that previous USRDS results for a 1986-1987 cohort of incident patients showed similar levels of comorbidity between PD and HD when adjusted for age, gender, race, and diabetes (32). One result we obtained that to our knowledge does not appear elsewhere was the significant gender-by-treatment interaction present among diabetic patients, in which females had a significantly higher relative risk of death on PD versus HD than did males. This result, coupled with the increased risk associated with PD for diabetic patients over the age of 50, suggests that the majority of risk may be concentrated in older female diabetic patients. As an informal test of this hypothesis, we performed a subgroup analysis of incident and prevalent diabetic patients, in which females over the age of 50 were excluded from the analysis. We found that among the remaining diabetic patients, there were little or no differences in the average adjusted risk of death between PD and HD (1989-1991: RR = 1.03, P = NS; 1990-1992: RR = 1.03, P = NS; 1991-1993: RR = 1.08, P = 0.035). In fact, among female diabetic patients, the RR was between 0.91 and 0.94 for those under the age of 50 compared with 1.37 to 1.40 for those over 50. Among male diabetic patients, the RR was between 0.79 and 0.85 for those under 50 versus 1.21 to 1.25 for those over 50. In both age groups, the relative risk for males was significantly lower than for females (P < 0.005). 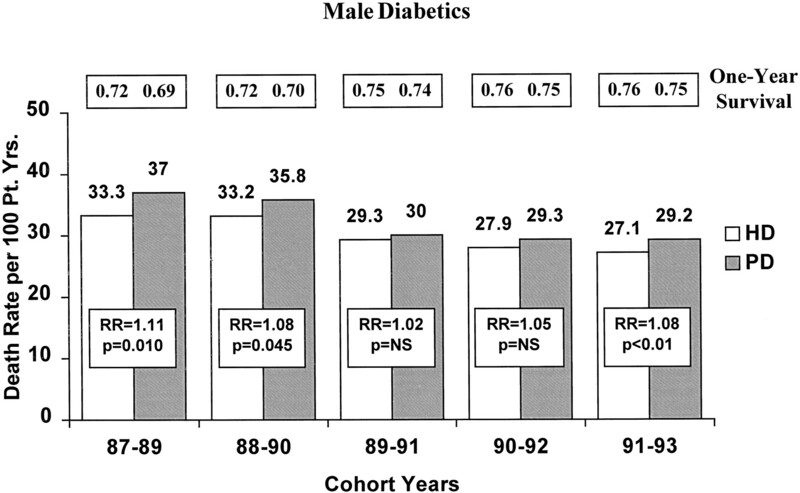 Although lower, the RR was still high for male diabetic patients over the age of 50. However, the RR varied considerably across the different 5-yr age groups, with some age groups showing no difference in risk (e.g., RR ranging from 1.00 for ages 80 to 84 to 1.12 for ages 55 to 59, P = NS) and others showing significant differences in risk (e.g., RR ranging from 1.22 for ages 50 to 54 to 1.38 for ages 75 to 79, P < 0.001). This fact, combined with a lower risk among younger male diabetic patients, explains why, on average, there was little or no difference in the overall adjusted DR between PD and HD male diabetic patients. It is not clear why female diabetic patients over the age of 50 would contribute so much to the increased risk of death. One possible explanation is that older female diabetic patients with vascular access problems may be preferentially selected to PD. If true, it may be that these patients also have a higher degree of malnutrition and/or cardiovascular disease at the start of dialysis, both of which are known risk factors for increased risk of death (35). Clearly, further investigation of this subgroup is warranted. Paradoxically, what has been cited as an advantage with national studies of this size (17) may in fact be a hindrance when discussing the clinical relevance of the findings. Too often, the clinical relevance attached to an observed difference between two treatments is judged solely by the statistical significance placed on that difference rather than on its clinical implications. In this national study, the sample sizes are such that we are virtually assured of detecting statistically significant differences in mortality despite the fact that the observed differences may be clinically irrelevant. This is particularly true for the 1991-1993 cohort of patients, which is nearly twice the size of the original Bloembergen study. To illustrate this point, consider the results in Figure 2. Except for an increase of more than 9,000 deaths and more than 38,000 patient years at risk (Table 2), the only change from the 1990-1992 cohort to 1991-1993 cohort is a decrease of 0.3 deaths per 100 patient years among HD patients. For the 1990-1992 cohort, there was no statistically significant difference in mortality between PD and HD (an absolute difference in DR of 1.1 deaths per 100 patient years or a 1% difference in 1-yr survival). Yet for the 1991-1993 cohort, a statistically significant difference in DR between PD and HD was found despite the fact that no clinically relevant change occurred from the previous cohort (when rounded to two decimal places, both cohorts have the same adjusted 1-yr survival estimates). To further illustrate this, we calculated the power (chance) of detecting various differences in the risk of death among the 1991-1993 cohort of nondiabetic patients treated with PD (32,194 patient years) versus HD (200,562 patient years). Assuming that the HD DR is 15.4 deaths per 100 patient years (or a 1-yr survival of 85.7%), the chance of detecting a difference of 0.5 deaths per 100 patient years in the PD population is 29%. This difference translates into a PD DR of 15.9 deaths per 100 patient years (RR = 1.03), or a 1-yr survival of 85.3%. Similarly, the chance of detecting a difference of 0.8 deaths per 100 patient years is 63% (PD DR = 16.2, RR = 1.05, PD 1-yr survival = 85.1%), and the chance of detecting a difference of 1 death per 100 patient years is 84% (PD DR = 16.4, RR = 1.07, PD 1-yr survival = 84.9%). In all three cases, there is less than a 1% difference in actual 1-yr survival, but the sample size is so large that there is a very high probability of finding a statistically significant difference regardless of its clinical relevance. It is for this reason that although many of the results reached statistical significance, especially for the 1991-1993 cohort, we believe that some of the differences in mortality are not clinically relevant, particularly among the 1991-1993 nondiabetic patients (Figure 3), and 1991-1993 male diabetic patients (Figure 7). Finally, although there is a trend of decreasing DR among both PD and HD patients across the five cohort periods, the trend for the 1991-1993 HD cohort is more pronounced than the corresponding PD cohort. This produces a slight increase in the 1991-1993 PD:HD RR compared with the 1989-1991 and 1990-1992 cohorts. This potential trend may reflect the fact that inadequate dialysis has only recently surfaced as an issue for PD (35), while it has been a topic of much discussion in HD for the past decade (36, 37, 38, 39). However, it should first be determined whether this is a trend. This can be accomplished by continuing to monitor the adjusted DR between PD and HD over time. The present study, while confirming the earlier findings by Bloembergen et al. (17), provides new information on later cohorts, which suggests PD and HD have similar overall mortality. There is evidence to suggest that the use of prevalent-only patients may be a source of bias in favor of HD when comparing mortality differences. The inclusion, in later cohorts, of both incident and prevalent patients provides a better basis by which to compare PD and HD mortality. Like Bloembergen et al. (17), the present study is limited in that we were unable to adjust for case-mix differences in comorbidity and disease severity. We also were not able to adjust for the dose of dialysis or the nutritional status of the patient, both of which are known predictors of mortality (35, 36, 37, 38, 39, 40). Nevertheless, given these limitations, we found that except among older diabetic patients, especially older female diabetic patients, patients treated with PD have similar (nondiabetic patients) or better (younger diabetic patients) survival than patients treated with HD. Since these results are consistent with the case-mix adjusted results from the Canadian registry for all patients except the older diabetic patients, further investigation of mortality differences in the United States among elderly diabetic patients is clearly warranted. In the absence of a randomized trial comparing PD with HD, larger studies with more careful attention to case-mix adjustment, including adjustments for disease severity, dose of dialysis, nutritional status, and quality of life, are needed to better ascertain if differences in outcome between patients treated with PD versus HD truly exist. We gratefully acknowledge the thoughtful review of the manuscript by Dr. Lee Henderson, Dr. Salim Mujais, Dr. Naseem Amin, Dr. Marsh Wolfson, Mr. Derek Wagner, Mr. Larry Yost, and Ms. Rosalie Villano. WHAT IS THE OPTIMAL FAT MASS IN PERITONEAL DIALYSIS PATIENTS?